Java 7 Swing supports windows with transparency and non-rectangular shapes. 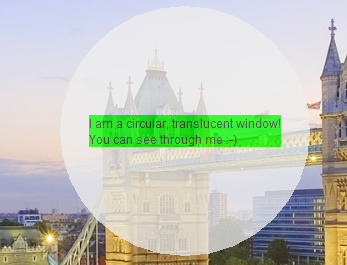 The following screenshot shows a circular window created with 75% opacity. You can create a translucent window by altering its opacity using the setOpacity method on a JFrame. Note that you can only create translucent windows if the underlying operating system supports them. Also, ensure that the window is undecorated by calling setUndecorated(true). To change the shape of the window, call the setShape method inside the componentResized method, so that if the window is resized, the shape is recalculated as well. * circular shape and a 75% opacity. Hi, I'm Fahd, a software developer at an investment bank in London. I am passionate about technology and work mainly with open source software, specialising in Java applications and Unix-based operating systems. This blog is a place for me to share useful code snippets to solve problems that I have come across, and to write about ideas and experiences as a programmer. All code on this blog has been written by me, unless stated otherwise, and you are free to use, share and adapt it for any purpose, under the terms of the GNU General Public License.